Lately we've been discussing HigherEdPoints more here on Rewards Canada due in large part to our new Guide to miles and points for students. Now we have even more news on this company. As you may be aware the only miles you could redeem for education credits via HigherEdPoints were Aeroplan miles. Well as of last week a second program has joined in. TD Rewards. This is great news for those who carry TD cards likes the TD First Class Visa Infinite Card, TD Platinum Travel or TD Classic Travel Visa card. All of these cards earn TD Rewards Points, the First Class and Platinum at 3 points per dollar while the Classic is 2 points per dollar spent. So how many TD Rewards Points does it take to receive an education credit at more than 75 post secondary institutions and two government student loan programs? As you can see it is 62,500 points for $250 in education credits. If you take their top earning cards this equates to 20,833.33 in spending to get the credit. This is roughly a 1.2% return. The same as the new 'book any travel rate' that kicks in on November 15th but is lower than the 1.5% return for redeeming those points via Expedia for TD. All in all this isn't that bad of option for TD Rewards points holders! If you are a numbers person this is definitely a better value than what is seen with Aeroplan redemptions. 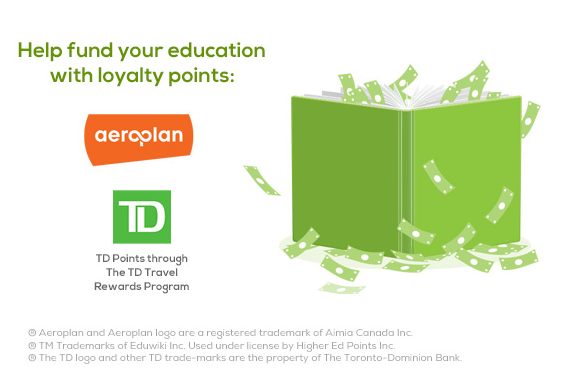 Find out more about the TD Rewards for HigherEdPoints credits here.